驾驶员可关闭 PRE-SAFE® 制动系统。如果将其关闭，它将保持关闭状态直到再次开启，而车辆每次启动时都不会默认设置为“开”。 PRE-SAFE® Brake complements the basic PRE-SAFE® system to help predict when an accident is likely to happen. 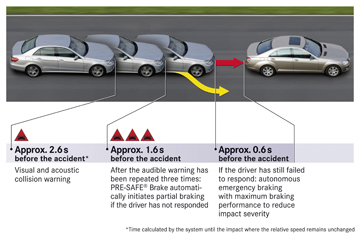 To do this, PRE-SAFE® Brake requires a sufficient radar reflectance of objects which the car is approaching. Also, the radar sensor needs a clear ‘view’ of the road in front and its efficiency is compromised by contamination such as snow, mud or leaves.